First, I want to thank everyone for the feedback on the MK dress (Vogue 1090). Clearly there is meant to be a fair amount of ease in the dress - a fact that I overlooked when choosing a size. As Patsijean said, it is not intended to fit like a sheath dress, which is how I was approaching it. Barbara gave some helpful tips on adjusting the armscye. She also noted this fitting issue is sometimes seen when someone has a small upper back & a very erect posture, which made me chuckle as my posture is anything but. I swear I could be about 2 inches taller if I worked at it. A couple of people suggested adding a bust dart - and there is already a bust dart included, so more adjustment possibilities exist there. Bonnie suggested adding an underarm gusset. I already gave the dress to my coworker last week, otherwise I'd certainly give this a try. Liana noted that the photos on the Vogue designer pattern envelopes are the actual designer garments, not a garment that was drafted from the Vogue pattern. I knew that this was true of Patrones but I didn't know it about Vogue! In that case, now I know it's helpful to study the runway photos of the garment to know how the designer intended for the garment to fit. I was really trying to avoid making a muslin, but it looks like now I'll have to do exactly that! I love longer tunic style tops in the summer. I've got this in progress with a white gauzy linen. It's got interesting seamlines - the front yoke and the undercollar are cut as one piece. I'm in the midst of this unconventional collar construction right now, so cross your fingers for me, and I'll show you the details soon. A spread on trench coats includes an up close look at the classic Burberry trench. Coats 114 and 115 are unlined, which would be a perfect way to use the Burberry coating that we all went crazy for in early 2008. I had been thinking of following Leslie's lead, she used BWOF 1-2008-128 and ended up with this uber-fabulous trench. But maybe I should use this new pattern instead so I won't be a total copycat. Typically the mens patterns in Burda magazine are not really my husband's style, but some of this month's patterns come pretty close if done in the right fabrics. This fitted button up with epaulets may be my first rendezvous with menswear. Lots of projects! Looking forward to seeing the results, espacially for the trench! There are too many great things going on with the last two BWOFs. I also need to get on my trench coat. And, I think they are right. Vogue does not have as much crazy ease. I have a slew of wrong-sized patterns for them because I also assumed they had that ease. 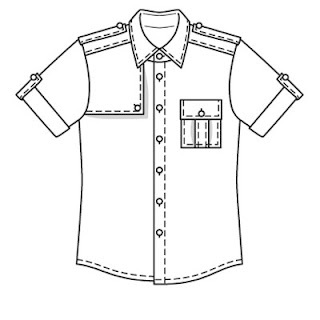 I have been reading and re-reading the instructions for blouse 106 and can't *quite* picture the step where you sew the undercollar to the yoke/collar (if the undercollar is already sewn to the back neck and the yoke is already sewn to the front and the shoulders, how do you get them right sides together????). So I'm eagerly awaiting the results of your experiment! Huh, I didn't know that about the Vogue designer patterns either! I'm so jealous you got the March issue already. I really want to un-petite the petite dress for my birthday at the end of March so the sooner it arrives, the longer I'll have to tweak the fit! Me too, I like that tunic blouse. Sometimes BWOFs grow on you, right? Ack, March isn't out here yet. I need more FABRIC. I loved Feb, but have no fabric to sew! Tunic blouse is on my list too. 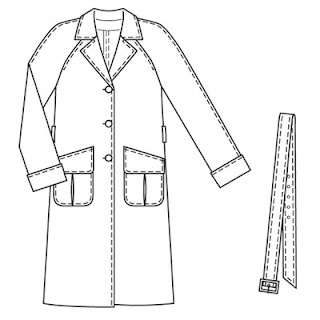 I am looking around for a trenchcoat pattern so that I too can get it done! I have the black too. I also bought the lining and some red wool and cashmere for a button out lining for this. Ooh that blouse is nice! And I was also looking at the trench patterns in the recent BWOF (just to torture myself). So many options! 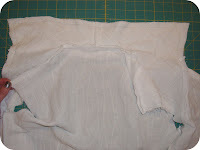 I think you are on the right track with a raglan style sleeve because of the fabric. But it's so fantastic it'll make any pattern look good. I just wanted to add I was a little disappointed that they did not give directions on making the button out lining. I need to borrow someone's lining book. Well, this month was my first BWOF. 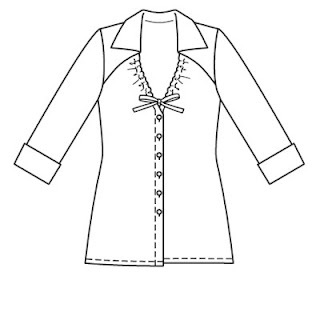 I want to make the long sleeved mens shirt, the white blouse and a dress. However, I really don't know the best way to trace the patterns or where to get some tracing pattern paper. Can anybody help me. I don't see great so I will have to have some help with this. I love that first top. Check out my blog for your Sisterhood Award. I just subscribed to BWOF and got my first issue a few days ago - I've already got #102 dress traced and ready to go.. I'm happy that it's the sewing course this month! Donna - try tracing paper on the roll from the art department at your local Michael's equivalent. 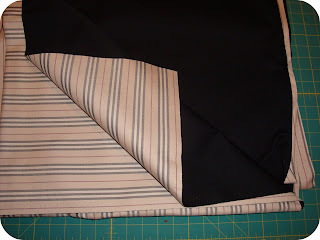 I've been using a compass to get the 5/8" seam allowance add-on to the pattern pieces and so far, so good. Donna - Email me (my address is on the righthand side) and I can point you to some online resources on using Burda magazine patterns.